When an Italian tells a joke disparaging the Italians, is it less insulting – or just insensitive and ignorant? Although Graeme Simsion’s The Rosie Project is a humorous romantic tale, the underlying ridicule of someone with Asperger’s syndrome is hard to ignore. If you can dismiss the main character’s social ineptness as the idiosyncracies of the stereotypical professor nerd, you might enjoy the ridiculous situations and laugh at the literal comments. If you can appreciate the happy ending as hope for those who suffer being different, you might bask in the possibilities for improved relationships. If you can forget the author’s references to autism, you might see awkward actions as charming. Although I laughed at times at Don’s misadventures as he searches for the perfect mate and finds one in the imperfect Rosie, I felt uncomfortable doing so. 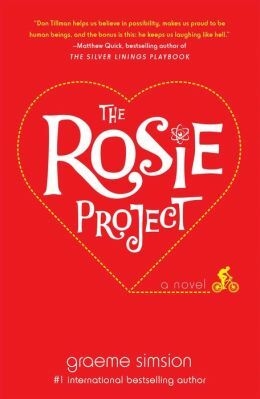 This entry was posted in authors, book review, books, essays, humor, new article, romance and tagged Asperger syndrome, Australia, Gabriel Roth, Graeme Simsion, New York, Romantic comedy film, Rosie, Rosie Project, The Rosie Project. Bookmark the permalink. I’ve heard a lot of people talking about this one in the blogosphere recently but I’m glad I read your review before deciding to buy it. It sounds like one I’d feel very uncomfortable reading. The books has been getting good reviews and will be made into a movie. When I finished, I thought about not reviewing it, but decided to anyway. It was funny and romantic, but a little disturbing – to me, anyway.